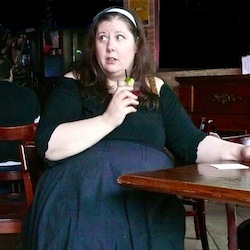 One Night (Beautiful Gem Productions) at the Toronto Fringe Festival is about a 32-year-old plus-sized virgin named Penny (Angela Brown). Unhappy with her life; an unsatisfying job, annoying co-workers, an overbearing mother, and of course the absence of any sort of carnal satisfaction, Penny decides to finally lose the big “V”. Getting laid isn’t as easy as Penny thinks, years of dealing with issues with her negative body image has lowered her self-esteem to the point where she fears intimacy. Her friends push her to talk to Troy (Nick Stojanovic), a handsome, young guy flirting with her at a bar, but Penny is reticent because she knows Troy is a player and much more sexually experienced than her. With a set-up like that I was expecting a funny, thought-provoking and ultimately heartwarming show about a woman’s coming to terms with her own body image and self-confidence and indeed I think that is what One Night strives to be. Unfortunately, I don’t think the show quite lives up to its aspirations. I thought the performance felt under-rehearsed and there were severe problems with the flow and pacing on opening night; parts of it just seemed to drag. I also felt that the show struggled to find the right tone and the humour felt forced and awkward to me. While Brown is careful not to play up the pathos in her character for pity, I also don’t think Penny was sympathetic enough to really sell as a compelling lead character. I also think the script still needs work. I don’t think it explores its subject matter in enough depth or in a way that feels particularly satisfying. I was waiting for the play to build to a big “A-ha” moment that never came. There are no bold statements about body image and societal pressure to look a certain way or comments on our hyper-sexualized society. One Night is essentially a personal story told in an almost unbearably earnest manner. I do think it’s a perfectly serviceable concept and that its heart is in the right place. There’s a show in there somewhere, I just don’t think it’s quite there yet.